Gently refresh locks with the Balmain Hair Moisturising Shampoo; a deeply nourishing formula that eliminates impurities from natural, treated or coloured hair, whilst imparting a mysterious, feminine fragrance. Enriched with pure organic Argan Oil and Pro-Vitamin B5, the revitalising shampoo delivers superior hydration, calms irritated and sensitive scalps, and softens hair to leave it sleek and manageable from root to tip. UV shields protect against environmental aggressors to maintain vibrancy, revealing stronger, smoother locks with enhanced shine and elasticity. 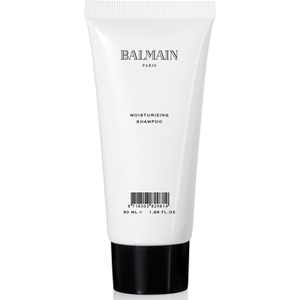 Apply to wet hair, massage softly and rinse out thoroughly. Aqua, Sodium Laureth Sulfate, Decyl Glucoside, Cocamidopropylamine Oxide, Sodium Cocoamphoacetate, Glycerin, Argania Spinosa Kernel Oil, Silk Amino Acids, Panthenol, Coco-Glucoside, Glyceryl Oleate, Dimethylpabamidopropyl Lauryldimonium Tosylate, Propylene Glycol Stearate, Guar Hydroxypropyltrimonium Chloride, Lauryl Glucoside, Glycereth-2 Cocoate, Sodium Laureth- 11 Carboxylate, Polyquaternium-44, Laureth-10, Glycol Distearate, Acrylates Copolymer, Parfum, PEG-18 Glyceryl Oleate/Cocoate, Phenoxyethanol, Iodopropynyl Butylcarbamate, Citric Acid.